22.04.2019 | At the invitation of the President of the Republic of Uzbekistan Shavkat Mirziyoyev, the President of the Republic of Korea Moon Jae-in paid state visit to Uzbekistan on April 18-21. 22.04.2019 | During the state visit to Uzbekistan, the President of the Republic of Korea Moon Jae-in has arrived in Samarkand. 20.04.2019 | President of the Republic of Korea Moon Jae-in, who is in Uzbekistan on a state visit, has arrived in Samarkand. 20.04.2019 | On April 19, the first ladies of Uzbekistan and South Korea Ziroat Mirziyoyeva and Kim Jung-sook visited a number of social and cultural institutions. 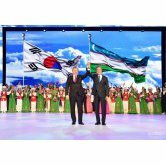 20.04.2019 | President of the Republic of Uzbekistan Shavkat Mirziyoyev and President of the Republic of Korea Moon Jae-in together with their spouses took part in a concert of art masters of the two countries. 18.04.2019 | At the invitation of the President of the Republic of Uzbekistan Shavkat Mirziyoyev, the President of the Republic of Korea Moon Jae-in arrived in Uzbekistan on April 18.